The poem I taped to the fence at Mt. 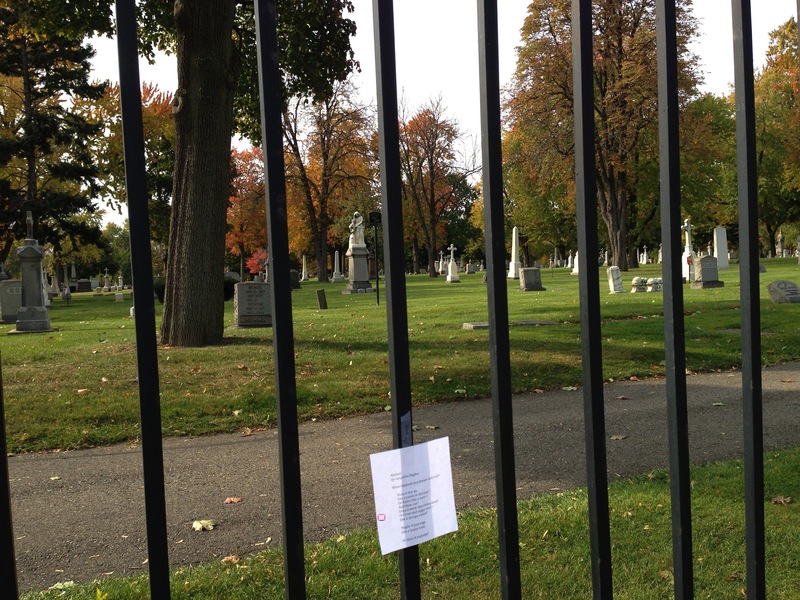 Elliott Cemetery in Detroit and the poem I’ve copied directly into this blog are not the same. 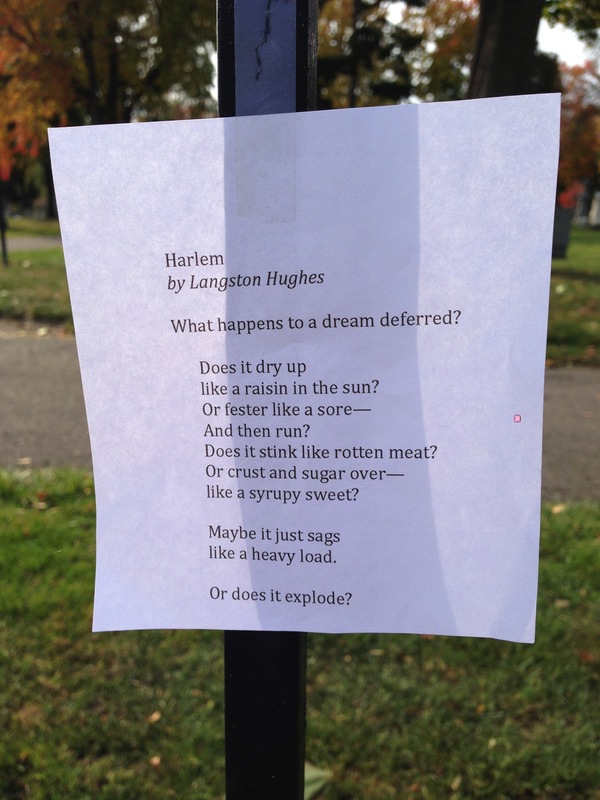 The first version of “Harlem” is the familiar one, but the second, taken from the Poetry Foundation, is probably the definitive text. In print, the difference between an un-italicized last line and an italicized one seems a matter of style, but as I consider each version, that little difference takes on more substance. “Or does it explode?” sounds like a rhetorical question, in line with the other questions in the poem. But “Or does it explode?” sounds like a warning. But when I see, thanks to the italics, the barely contained frustration of that last line, the poem becomes political all at once, a protest against the limits imposed on the lives of black Americans. Somehow I had missed the implication of “deferred” in “dream deferred.” Dreams fester and rot not because the dreamers have lost faith in their dreams or are too timid to make the leap, but because an outside force has deferred the dream. There’s a chilly bureaucratic feel to deferred, as if someone stamped a stack of handwritten dreams with the dreaded word and passed the pile on to another desk. Not now, not now. Come back on Tuesday. The other meaning of deferred—to submit to another’s wishes—is at work here too. How would it feel to have your dream deferred by someone you’re supposed to pay deference to? Read in this light, I guess “Harlem” doesn’t really belong where I placed it. The Mount Elliott Cemetery is a beautiful sanctuary in southeast Detroit originally built for Irish Catholics. I had passed by the cemetery after visiting the Solanus Casey Center across the street. With the poem in my purse, taping it to the fence seemed like a pretty good idea at the time or at least convenient. By the way, lots of famous Detroiters are buried here, including Beaubian, Campau, Chevrolet, and Hamtramck. (If you’re interested in Detroit history, you’ll enjoy great blog called Night Train. Link here for Night Train’s post on the Mount Elliott Cemetery. Before he found success as the first African-American to earn a living from his writing, Hughes worked as a sailor, a doorman, a waiter, a cook and a truck farmer. He attended Columbia University and graduated from Lincoln University in Pennsylvania, where his classmate was Supreme Court justice Thurgood Marshall. He published two autobiographies, several children’s books and wrote a popular column for the Chicago Defender for twenty years. He died at age 65 of prostate cancer.